Last visited by Zerver on Feb 4 99Has been sponsored by OSI with locked down furniture and a landscaped garden. The feelof the whole place is very nice. The vendor is usually well stocked with food and spirits. The park and fountain outside look to be a wonderful gathering place. 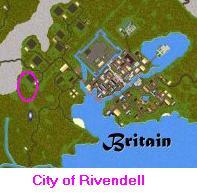 Most times when I visit Rivendell there are members of the Knights of Rivendell guild, or other locals. It is really becoming quite a community. People pop in constantly just to talk, have a quick drink, and then be back on their way. I have met several who seek to become members of the Rivendell Community. Theyhave been around the area long enough. The Hungry Halfling has been around a verylong time and receiving more and more prestige.